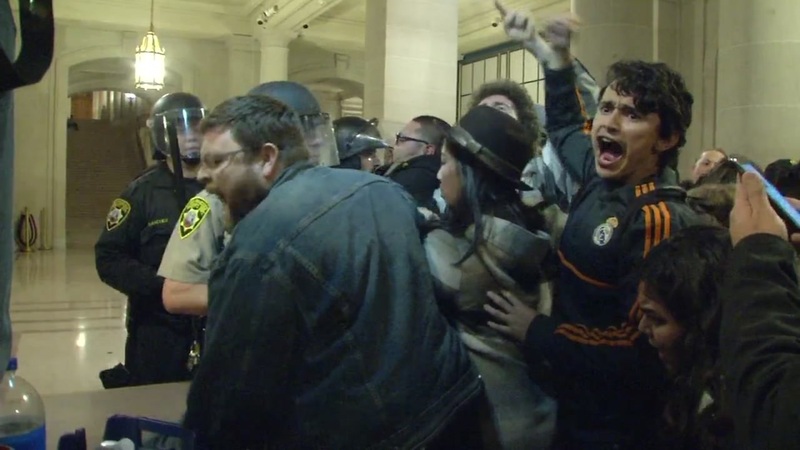 SAN FRANCISCO (KGO) -- Deputies in riot gear have clashed with protesters who are protesting at the San Francisco City Hall. Officials report that 33 people were arrested, including 19 women, 13 men and one juvenile, who was never booked. The protesters were booked for misdemeanor trespassing and refusal to disperse. Most of them were released Friday. The remaining protesters are expected to be released by Saturday evening. 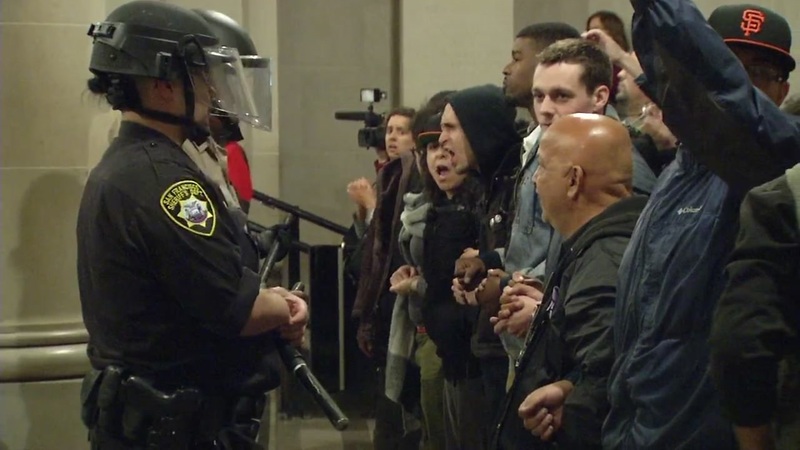 Deputies in riot gear clashed with hunger strike supporters who are protesting at San Francisco City Hall. The demonstrators were eventually pushed out of the building, where they continued their protest. The protesters were pushed out of the building but they are still refusing to leave. They gathered underneath the balcony of Mayor Ed Lee's office. There's been a lot of pushing and shoving and yelling and a few arrests. Demonstrators want the Police Chief Greg Suhr fired. They accuse the department of police brutality and unnecessary killings. The group chanted outside Mayor Ed Lee's office before being forced downstairs. They knocked down a metal detector and used it to prop open one of the doors. They were there in solidarity with five hunger strikers who have been hospitalized. Their friends tell ABC7 News they're continuing the hunger strike from the hospital beds. They are refusing to be force-fed. Police are staged outside city hall to assist if things get out of hand. There's no word of any injuries but the protesters did call for an ambulance. They tell ABC7 News they plan to stay here all weekend but if they can't, they'll take the demonstration back outside the Mission Police Station. As of Saturday morning, there were no protesters at the station.